From the articles at the links, we find a little more info concerning a Lockheed Martin Air-to-Air Missile concept that 'someone' would like to be developed into a viable weapon system. Read it all at the sources, I'm not going to repeat verbatim what was revealed here, we'll just use the info as required. There's not much hard info to go on yet, and I would hesitate to speculate about it, like I'm going to, if it were an actual DoD program. I'm also going to play off comments, if there are any, that may come up on this topic. Notice I've placed "question marks" for the ~12 inch long section behind the guidance section. As Scott Lowther observed at his place, that is the most mysterious aspect of the design. The section could involve something really new and different in missile design, but at least part of it is (as shown) a warhead, as the yellow band indicates a High Explosive present. Since the missile is 'Hit to Kill', the explosive weight of the warhead should be much smaller than the warhead in a 'Proximity Fuzed' weapon. That leaves ~8 inches of mysterious 'spots' to be explained. I can think of a lot of functions that these 'spots' could be related to, and in the absence of additional information, none leap out as 'most likely'. If we begin making assumptions, then.....maybe some do. 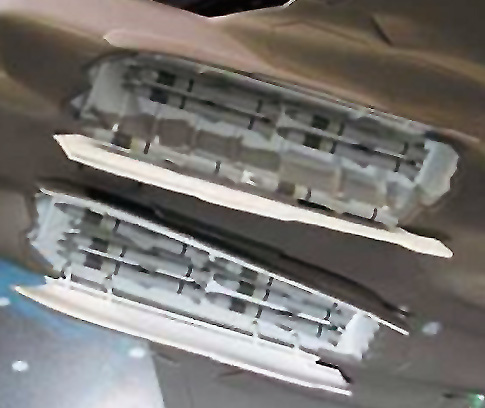 If we assume capabilities planned for the F-35 affected the design, then perhaps some sort of data link antenna array? If we assume it is related to the warhead (or as I mentioned at Lowther's place in the comments, the trademarked CUDA name) are there 'teeth' in there to shred airplane structure and systems after it has impacted? The concept as presented (size of an SDB) would have pretty decent supersonic drag, as it's 'fineness ratio' is close to the optimum ~14 (Raymer) which is a good thing (but no guarantee) for getting longer 'range'. It is about equidistant on the short side from the optimum as the AIM-7F/M Sparrow is on the high side. See table below. Because the proportion of mass that is rocket motor in this concept is much higher than typical missiles, I would expect it accelerates to max speed over launch speed much faster than anything we currently use. The upper limit of the speed reached may be higher than other missiles as well, in multiples of speed of sound. But from the ogive shape of the nose, which is a shape that balances aerodynamic and RF transmissivity requirement, not as fast as it might otherwise be (not a bad thing, maneuverability is still needed (are we back to those 'spots' again?). One CUDA Missile Carriage Concept: 12 CUDAs in F-35 Weapon Bays, 6 to a side. Another source adds: "Let's just say if they can turn a missile into a 'hittile' that is a big deal." If you weren't around when British Aerospace was using that turn of the phrase as a marketing hook for their point-defense Rapier missile system, you might think the 'another source' above was being pretty clever. Part of the unknown section is a high explosive unless that yellow band means something different than it used to. Probably not the whole section, but at least some of it. Most HTK systems have at least some explosive filler to supplement the impact IIRC, so it makes sense there too. I don't get the concept here. CUDA appears to be 60% of an ASRAAM (maybe a bit more given the small warhead). There's no mention of using novel propulsion, so I have to believe this is a WVR round, right? The Aviationist speculates its use against SAMs, rockets or other missiles, but is that really a needed capability? That is almost the exact sentiment, in different words, that I posted in response to a commenter @ The Aviationist's place, and similar to what I said at The Unwanted Blog (Citing MilStd-709D no less. I didn't have an opinion as to 'range' until I started playing with possible mass properties using the SDB dimensions and assuming same or incrementally improved tech over the AMRAAM. I hear that it is now 'out there' that this is a 'Medium Range' missile, and I believe it. I'll be crunching some speculative, but formed by logic and experience, numbers in my next post. Could be right or wrong, but it will 'make sense'. I'm also not ruling out a dual-capable A2A/A2G weapon, when launched by the right aircraft. The "???" part is probably (likely) meant to be a central battery and/or explosive with a ring of minute charges around. These are also known as "lateral control" or from MBDA: "PIF" (pilotage en force). Such minute charges support maneuvrability. Every such 'dot' has (I suppose) a slow-burning charge (more like rocket than explosive) that yields a sideways thrust once for a short time (split second). This is off-centre of gravity and thus imparts a turning moment on the missile. Thanks for taking time and interest! I linked to a forum there, and said forum has later info on the missile.